It’s starting to become a little bit of a regular thing – my boyfriend and I just having a random day in London. We try to visit somewhere new every time we go, but the truth is, you could spend every day trying out a new place and you still wouldn’t manage to experience everything, so I think there may be quite a few blogs to come on this subject! If you’re a Londoner, you may well have discovered these places already, but I’m hoping to publish cafes and restaurants that are more of a random find or off the ‘beaten track’. So, even if you’re a local, I hope you manage to find at least one place to add to your to-do list! We were on a bit of mission and managed to fit 7 different visits in, so this blog may be quite long. I’ll try to stay to the point and not drift… or babble.. like I sometimes do! First stop of the day for us was actually in Reading where we were catching the train to Paddington. There is this cute little ice-cream parlour in the station called Tutti-Frutti and they do fabulous coffee! They are in competition with some of the big chains so we always like to pop in to support them when we can. The coffee is great and service is 100% happy! Run by a very joyful, enthusiastic married couple, we always find our visits here to be fun! If you decide to go, or already have been you should know exactly what I mean. Moving on to London. First stop of the day was Kaffeine. Now I know this isn’t a random find, but as you may have picked up in my recent blogs my boyfriend and I are big coffee fans, him more so and we’d read so much about it that it would have been a shame not to visit. Plus its supposedly one of the best coffee shops in London! My last coffee blog was about our visit to The Attendant so I went with high expectations! 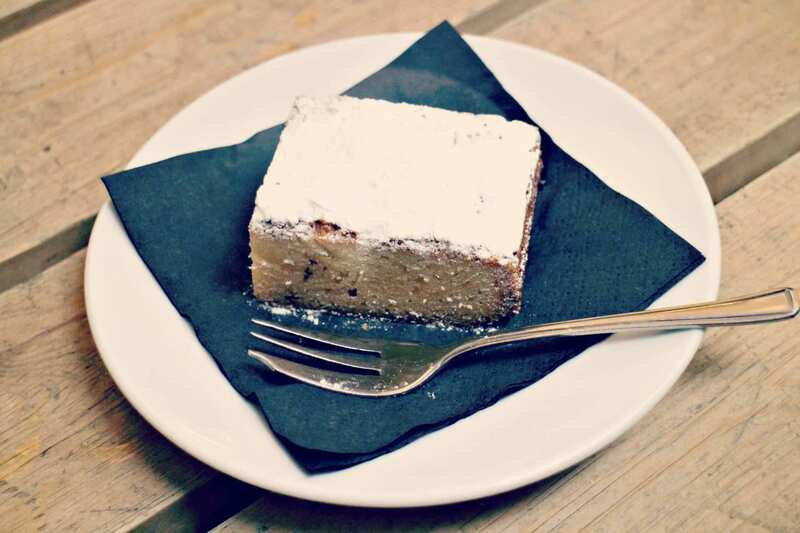 I ordered a Blondie (yes, I think its perfectly acceptable to eat brownies for breakfast) ahem… and a flat white. My boyfriend ordered the ‘Coffee Flight’ which is actually a trio of drinks. Firstly you have a palate cleansing cascara, a single shot of espresso and finally a Cappuccino. Kaffeine is an independent Australian/New Zealand owned café and we were served by a very helpful barista who took the time to sit down with us and explain exactly what the Coffee Flight is and how you are supposed to drink them. My boyfriend LOVED the coffee, he said it was the best espresso he had ever tasted! My flat white was equally as nice. The atmosphere was busy, but in a good way. Lots of people chatting, ordering food and a real good feel to the place. On this note, I decided to book my boyfriend on one of the Coffee Art classes for next month (for his birthday) as I just knew he would love the experience and as he is sooo difficult to buy for this seemed like the ideal present. An experience that will hopefully teach him how to perfect the lovely little fern on top of my coffee he makes me at the weekend 😉 Oh actually, it may quite fitting to mention a random coffee fact. Next stop on our itinerary was Milkbar. It wasn’t too far away so we decided have a walk rather than hop in a taxi. I always find walking so much more fun in London! I’m a total people watcher and you can guarantee you’ll always be entertained on the streets of London. It was easy to find and down a nice quiet street too. The café had a lovely retro, simple but inviting feel to it. I admired this gorgeous 50’s dresser they had behind the till too. I love vintage furniture as much I love vintage clothes! The menu was easy to read, very reasonably priced and the food was pretty tempting too! I ordered a ‘Bongo’ and my boyfriend decided to order the same too. If you like a cortado then you’ll also like the Bongo. Again, really nice and my bagel was pretty yum too. By now I was having a little bit of a coffee rush so I also had some fresh mint water to help! I’m going to assume my boyfriends coffee was as good as mine as there wasn’t much talking going on as soon as they arrived and Instagram photos were out of the way! The tube to our next stop was a little long-winded and half the route was shut for maintenance so we decided to go for a stroll through Hyde Park. I know strolling through parks and gardens may sound like a bit of an activity for OAPs, but sometimes getting away from the bustle of the city is a little luxury. I was really excited about our next visit as this was my choice and somewhere I have been wanting to go for a few months. Anges de Sucres in Kensington is a patisserie selling macarons, marshmallows & coffee. Its girly, pretty and I’d heard nothing but positive comments on the place. Plus, after following Reshmi on Instagram for some time I was looking forward to seeing her #floralselfie mirror! On arrival the shop front is gorgeous! Whimsical and romantic with hand painted flowers & macarons. The inside equally as pretty. Macarons, or ‘sugar-angels’ in French, are a firm favourite of mine when done right, and these are! The flavours are perfect, the choice great. The coffee is high standard and I taste-tested some of the cold drip coffee which on a hot summers day would be very refreshing. Instead, and as usual I went for my flat white! Now I really was feeling the coffee buzz! So, to end our day we jumped on the tube and headed over to one of our favourite areas – Brick Lane. It was a Saturday so we knew the market was on, my boyfriend (I’ve said that word a lot, sorry) was dying for his spicy chicken (The Orange Buffalo) and I was feeling a bit peckish too! After mooching around, taking photos and enjoying the food we finally finished the day at another favourite of ours – Full Stop! Its cool, you can charge your phone (although I’m not sure you’re supposed to) and the Shoreditch Blonde ‘ale’ is refreshing! If you have any recommendations of somewhere you’d think we’d like to go please do comment or share your experiences of any of the places I have mentioned today.